Thank goodness for nitrous oxide... and UCSF Labor and Delivery was excellent. The birth couldn't have gone much better. Around 1:30 pm on Saturday, as we were driving up to San Francisco for a friend's baby shower, I started having slightly uncomfortable contractions. (We live in Mountain View, a 1 hour drive from UCSF.) After the baby shower, we went for a walk on the beach and dinner. We drove to UCSF arriving around 10:30pm. I was at 4cm and they thought I was in early labor and probably would have told us to go home if I hadn't had slightly elevated blood pressure. I don't know what time I started using the nitrous, some time between 11:30pm and midnight. My water broke as my dinner came back up, and moments later the anesthesiologist walked in with the nitrous oxide. It was kind of funny how gingerly he stepped around the large puddle of vomit and seemed not to know what to do about it, other than muttering about nurses cleaning it up. They checked me again at 1:30am and I was at 8cm. 4 or 5 contractions later, that nice break between contractions went away -- I had very painful contractions separated by slightly painful contractions. It crossed my mind that this might be transition, but I thought no way would it happen so soon after 8cm, and expecting I had about 2 hours of this left until full dilation and *then* transition I said something like "I can't do this." That was transition, so my words were right on cue. After 4 or 5 of these contractions, my body started to push. No one had told me I was fully dilated -- Seth said the midwife checked and did say something but I didn't hear her, and according to Seth she sounded very surprised and the staff seemed suddenly in a big hurry. Not realizing I was fully dilated, I tried to relax and not push. The more I relaxed, the harder my body pushed. In about 6 contractions the baby was out, born at 2:16am, Sunday Oct 18. Ania with 1 day old Moby. First photo in labor & delivery room. Call doula (Sandy Caldwell), ask her to come to UCSF. Membranes rupture and I throw up my dinner. Tue, Wed: I was due on Wed Oct 14 and feeling ready to reduce the size of my belly and say goodbye to the back pain. I'd heard that birth never goes exactly as planned and while I'd read Ina May's Guide to Childbirth and imagined a number of birth scenarios, somehow painless contractions never crossed my mind. Yet Tue Oct 13, I had painless but very obvious contractions all day. I had a check-up on Wednesday with Dr. Russ Laros, because my midwife (Sharon Wiener) was on vacation in Italy, and her surrogate (Suzanne Howard) was out sick. He had a lovely bedside manner. When we asked questions he'd take a seat like grandpa about to do story time, but then answer our questions very clearly and succinctly -- unlike that stereotypical grandpa. He was pleased with the vaginal exam but refused to speculate on whether the baby would come in one day or a few days. Thu, Fri: The contractions slowed. Nonetheless clearly things continued to shift about in my belly. On Friday, my brother Piotr and his fiance Stefie flew in from Cambridge, MA to help us out for a couple of weeks after the baby's birth. Sat morning & afternoon: We had fresh pineapple for breakfast, one of many online recommendations for how to induce labor naturally, although I speculate that being past one's due date is at least equally effective. Around noon, the four of us piled into the Subaru and headed north to San Francisco for Annaliese and David's baby shower. Just in case, we packed all our hospital stuff into the back, not truly expecting to need it since I hadn't been feeling many contractions. Sat 1:30pm: As we were nearing our destination, I shifted uncomfortably in my seat, since the baby seemed to have shifted onto some delicate internal organ. It turns out that was the first of three contractions I'd have in the car. The baby shower was really lovely and the food beautifully presented. During the gift opening, I kept shifting around in my seat and Seth timed a few of my contractions. Annaliese's mom kept smiling knowingly at me from across the room, but Annaliese was apparently unaware that one of her guests was in early labor until someone mentioned it to her later. After the baby shower, we went for a walk on Baker Beach and dinner at an Indian restaurant (7:45pm). I timed my contractions as we waited for food to arrive. They were 30 seconds long and 3 minutes apart, not meeting the 4-1-1 nor 5-1-1 rules. Sat 8:45pm: Since the drive from Mountain View to San Francisco is an hour, I suggested that we stop by the hospital (UCSF) for a vaginal exam to get a sense of how I was progressing. Then we could decide whether to drive home or spend the night at a hotel closer to UCSF. I called Labor & Maternity and the nurse sounded uncertain that we needed to come in at all, but given how far away we lived said we could come in. Sat ? ?pm: I was at 4cm. The midwife (Suzanne Howard) decided to check me in because my blood pressure was a little elevated and she was concerned about pre-eclampsia and wanted to continue monitoring it. Sat shortly before 10:30pm: They moved me from the small exam room to a labor and delivery room. The nurses asked for our birth plan (PDF) and read it intently. They pointed out that our request to donate the cord blood couldn't be fulfilled if we wanted to delay cord clamping until the cord stopped pulsating, and I tuned out from further discussion while Seth decided to delay clamping the cord. There was a bit of trouble getting the wireless monitors working (on account of the increased blood pressure, they wanted monitor me continuously). One nurse was asking me to hold still so she could adjust the monitors. A second nurse was asking me to get into a different position so she could put in the IV shunt (just in case -- not connected to a drip). And my body was asking me to find positions in which I could relax my belly during the contractions. 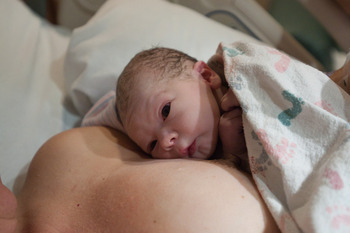 The midwife got a bit miffed that I wasn't cooperating, and I got a bit miffed that they were asking too much, and then it somehow all got worked out. I labored on all fours on the bed. Then tried the tub for a while, but it was shallow enough that I didn't feel I had enough mobility while keeping my belly submerged, and without my belly submerged the water didn't do much for me. Then I went back to the bed and shivered madly as I labored on all fours, feeling rather cold after the warm tub. Then someone suggested that I try the birthing ball. Sat ~12:10pm: I remember sitting on the birthing ball and resting my upper body on one corner of the bed. It was easier to relax my belly if my upper body was supported by something other than my abdominal muscles. I'd been feeling just slightly nauseated for perhaps an hour, and suddenly dinner came back up into a large puddle on the floor. With every stomach convulsion, water came out the other end. "I've either lost bladder control or my water just broke," I said. Seth convinced me to move to the other corner of the foot of the bed so I wouldn't be roll the ball into the puddle. Then the anesthesiologist walked in. He awkwardly mumbled something about the nurses cleaning up and did his best to gingerly step over and around the large puddle as he hooked up the nitrous setup. He started to try to tell me about all the anesthesia options. I said "I don't want the other stuff" and he handed me the mask and vanished. Seth later told me that another staff member had rushed in to tell him he was needed in the OR, which is probably why I was spared further conversation. Having read Prof Mark Rosen's 2002 publication "Nitrous oxide for relief of labor pain: A systematic review", I felt that I knew what to do and was happy enough just being handed the mask without a lecture. My Nitrous Oxide Technique: It took me some time to figure out how to make the nitrous work best for me. Nitrous takes 30-60 seconds to kick in. Initially, the 50% nitrous/50% oxygen was too strong for me, so I would breathe half of each inhalation from the mask and half without the mask. As labor progressed, I wanted the maximum effect. I would start breathing the nitrous moments after a contraction ended and continue until the peak of the next contraction, at which point I'd put away the mask so I could moan and get through the most intense moments without holding something to my face. Given the timing of my contractions (which I estimate remained 3 minutes apart through all of active labor), that method left me relatively unaffected between contractions and most high during the worst pain. Epidural: An epidural is an injection of bipivucaine or another similar medication near the spinal cord. This causes partial or complete loss of muscle control and sensation below the site of the injection. Given that I birthed my baby on all fours and that I spent most of labor in positions where I used my legs to support me, I wouldn't have wanted any loss of mobility. And just as nitrous doesn't work for all women, epidurals don't always work. I have one friend who ended up paralyzed from neck down during her labor; and another for whom the epidural only worked on one side, so she felt all the pain on one half of her body but couldn't move the other half. Fentanyl: I have two reasons to be glad I didn't take this. First, opiods suppress the breathing reflex and should not be given too close to delivery. Given that my short labor took everyone by surprise, my baby would almost certainly have been born with Fentanyl in his blood. It takes infants about 10x longer than adults to metabolize opiods. Second, I've taken Demorol and don't like how it makes me loopy and out-of-it. I have a friend who feels like she missed her daughter's birth; I wouldn't have liked to feel like that. Nothing: Having no pain control would have been difficult in the environment of a hospital where other options are so easily available. 12:30am: Our doula, Sandy Caldwell arrived. I was deeply focused on labor at this point. Other than "hi, Sandy," I didn't talk to her until after the baby was born. I recall her breathing audibly to remind me to breathe slowly and deeply. I have little recollection of other things she did: taking photos, including one of our favorites; and her and Seth putting wet towels on my back very late in labor after I declared I was hot. I do recall her helping my brother collapse onto the couch rather than the floor when he fainted as I was being stitched up after the birth. We're very glad we hired her. Sun 1:30am: 8cm dilated. After Suzanne (the midwife) declared this, I had 4 or 5 more contractions before the painless lull between contractions vanished. I was having intense, painful contractions separated by moderately painful contractions. It crossed my mind that this might be transition, but I thought no way would it happen so soon after 8cm. Expecting I had about 2 hours of this left until full dilation and *then* an even more painful transition I said something like "I can't do this." That was transition, so my words were right on queue. After 4 or 5 of contractions in transition, my body started to push. No one had told me I was fully dilated -- Seth said the midwife checked and did say something but I didn't hear her, and according to Seth she sounded very surprised and the staff seemed suddenly in a big hurry to arrange the surgical tools. Not realizing I was fully dilated, I tried to relax and not push. The more I relaxed, the harder my body pushed. In about 6 contractions the baby was out, born at 2:16am, Sunday Oct 18. What I didn't realize then was that Suzanne had asked Seth to catch the baby, and he did. Seth with his son, Moby, at 3:16am. Photo by Sandy Caldwell. After Sun 2:16am: The baby looked pale gray and was quickly whisked away. Apparently, it took him about 30 seconds to start breathing. 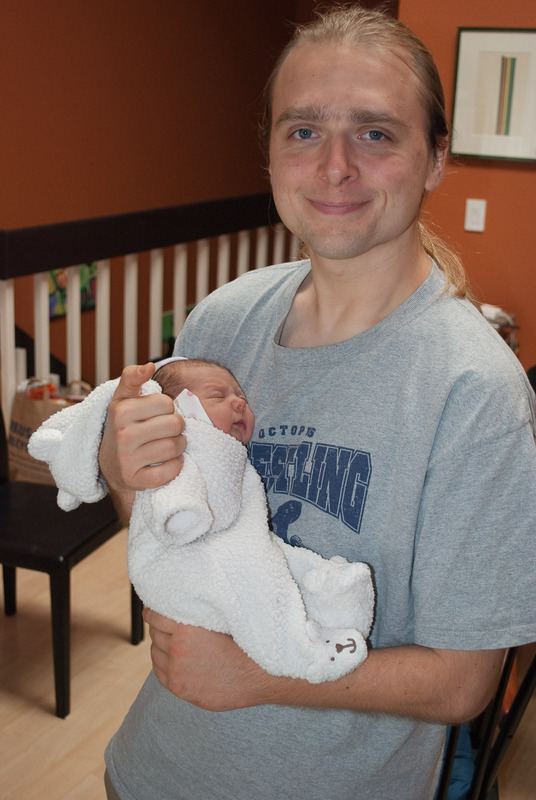 Seth and I speculated that the very quick labor left him little time to get ready for the transition from womb to air. I had some 1st degree vaginal tears and a labial laceration, so I needed a few stitches. Suzanne told me to keep breathing the nitrous. The doctor started to inject me with a local anesthetic but pushed painfully enough that I kept mostly involuntarily scooting away. Suzanne took over and with much less discomfort numbed the area. The doctor took an attempt at stitching with some verbal guidance from Suzanne, but she took over to finish the job. 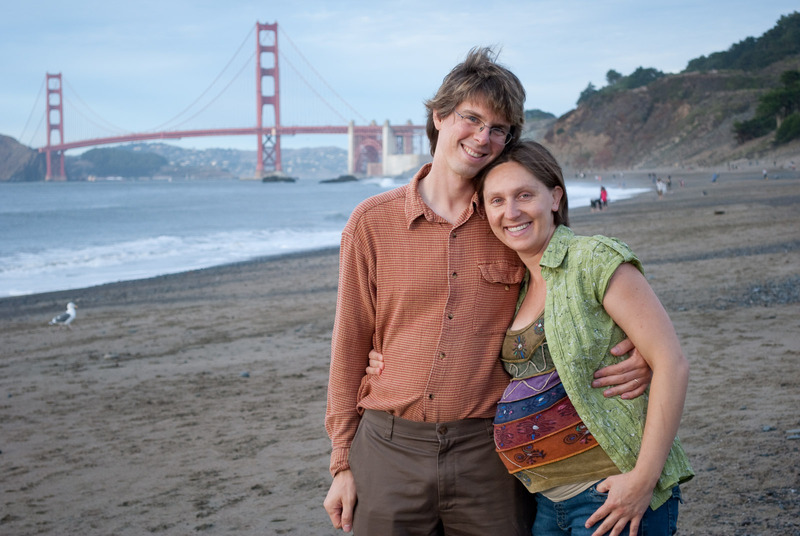 The night: I'm very glad we chose UCSF to have our baby. They respected my birth plan. All the baby check-ups and weighing were done in our room, except the federally mandated blood draw. The baby slept with me and except for one staff's comment, no one said anything about co-sleeping, which while common in many cultures is a somewhat controversial practice in this country. That said, no place is perfect and probably the largest drawback to birthing in a hospital is the lack of rest. For the 12 hours following Moby's birth, a nurse came in every hour to check either my or his vital signs. We've slept much better since we came home. Birth like a marathon? I've heard the description that birthing is like running a marathon in terms of how exhausting it is. I didn't find that to be accurate. Mine was exhausting because pain is exhausting, somewhat similar to the kind of exhaustion due to the pain of my ankle surgery. But it wasn't nearly as physically demanding as the same number of hours of backcountry skiing or alpine climbing. Within the first hour of Moby's life. You can see the above photos from Moby's birth day and also photos from Moby's early days. The hospital closest to our home is El Camino Hospital, 3 miles away. Yet we chose UCSF, an hour away in good traffic. Why? Photos by Sandy Caldwell, Piotr Mitros, and Seth LaForge. Text by Ania Mitros.